This angle shows the salvinia at the boat launch by the Hwy 9 bridge. In the foreground the plants are turning brown and the drawdown is evident by the water level. In the background bollards are being used to contain the salvinia and clear the channel. The LSU AgCenter has a new resource to help educate the public about the invasive weed giant salvinia. The website, www.lsuagcenter.com/giantsalvinia, looks at the problem of salvinia and control methods. Images and maps show how the aquatic plant has spread across Louisiana waterways. Giant salvinia is a free-floating fern native to southeastern Brazil. 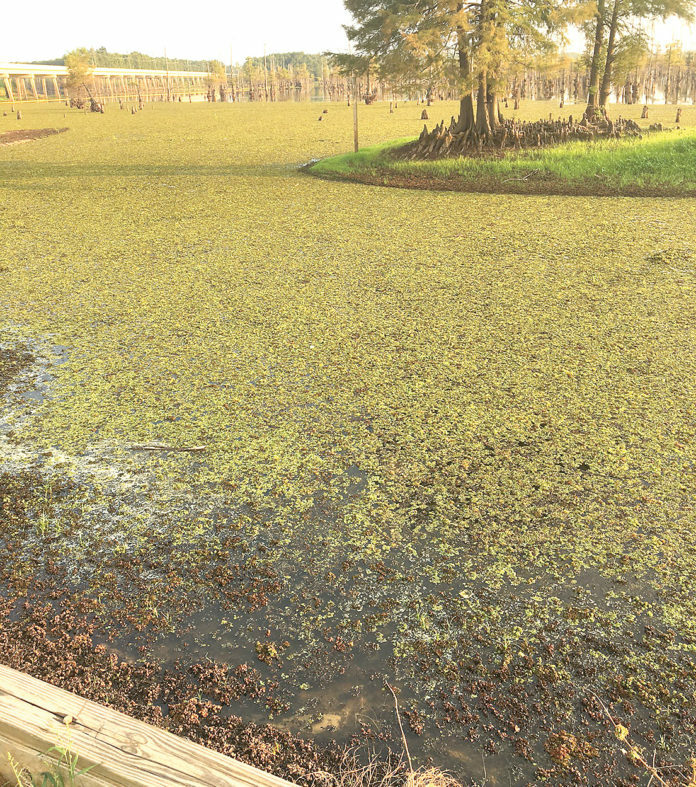 LSU AgCenter entomologist Rodrigo Diaz said it creates dense mats of weeds on lakes, ponds and reservoirs throughout the southeastern United States. The thick mats prevent sunlight from reaching the water column and suppress native vegetation while affecting fish, waterfowl and other species in the area. Diaz is conducting research on the salvinia weevil, an insect which feeds on the plant and has been shown to control it. This website includes information on how to recognize giant salvinia, its effects on aquatic habitats and how to use salvinia weevils to manage this problem. “Managing giant salvinia with biological control requires monitoring the population of weevils and salvinia conditions. We hope this website will be useful not only for plant managers but also people who enjoy wetlands,” Diaz said.